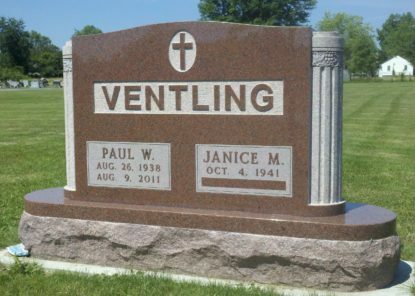 Ventling Memorials is a complete service Monument and Memorial company assisting and guiding families through the Memorial selection. Every Memorial is completed in our production facilities. We take great care for every aspect of your Memorial selection from the point of order to placing at the cemetery grave site. Our pride, quality and care from our seasoned staff and skilled craftsmen are transposed into your Memorial.